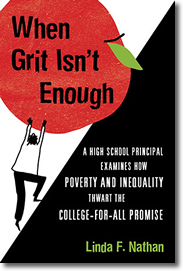 In When Grit Isn’t Enough, Linda Nathan investigates five assumptions that inform our ideas about education today, revealing how these beliefs mask systemic inequity. Seeing a rift between these false promises and the lived experiences of her students, she argues that it is time for educators to face these uncomfortable issues head-on and explores how educators can better serve all students, increase college retention rates, and develop alternatives to college that don’t disadvantage students on the basis of race or in- come. Drawing on the voices of Boston Arts Academy alumni whose stories provide a window through which to view urban education today, When Grit Isn’t Enough helps imagine greater purposes for schooling. Linda Nathan, EdD is the first Executive Director of the Center for Artistry and Scholarship (CAS). In this role, Dr. Nathan is responsible for working with the CAS Board to develop the nonprofit’s strategy, goals, and areas of focus. She oversees key programs including the Creative Learning Schools Project as well as the Perrone-Sizer Institute for Creative Leadership (PSI) in partnership with the University of Massachusetts, Boston. Dr. Nathan also works closely with the leadership of Conservatory Lab Charter School to support its development as a national model of project-based learning and arts immersed education. In When Grit Isn’t Enough, veteran educator Linda Nathan gives the lie to five popular but unproven beliefs about education that do little to improve schooling but instead blame the victims of poor and unequal schooling. This is a courageous book, one that challenges all of us, educators and non-educators alike, to do better for our most vulnerable students. It’s a marvelous book, and badly needed at this time. Drawing on the powerful stories of children at the Boston Arts Academy, Linda Nathan bravely confronts the widely circulated myth that children who grow up in poverty can overcome inequity and every other daunting obstacle they face if they just ‘believe,’ ‘persevere,’ ‘work like hell,’ and show sufficient ‘grit.’ Many of these students do prevail, but Nathan makes it clear that ‘grit’ is not enough and that our adherence to this appeasing myth is letting a divided and bitterly unequal social order off the hook. 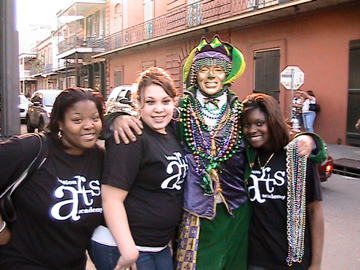 Sign up for the Center for Artistry and Scholarship mailing list to stay in touch!